In this edition of The Side Hustle Show, I’m joined by Chandler Bolt, co-author of The Productive Person: A how-to guide book filled with productivity hacks & daily schedules for entrepreneurs, students or anyone struggling with work-life balance. When Chandler first reached out, I was excited to learn we had a lot in common, including both being Eagle Scouts and both having run house painting companies in college. In fact, he cites selling candy at summer camp as one of his first entrepreneurial pursuits — just like me. Our conversation centers around the unique challenge of productivity for side hustlers with limited hours in the day to work on their business. How to come up with the 3 questions you should ask yourself before pursuing any new project. The tools, apps, and books to help you become a productivity ninja. The power of a daily habit, such as the daily writing habit. How to tell Urgent from Important, and Reactive from Proactive. How to find an accountibilibuddy — and why you need one! Chandler’s #1 tip for Side Hustle Nation. 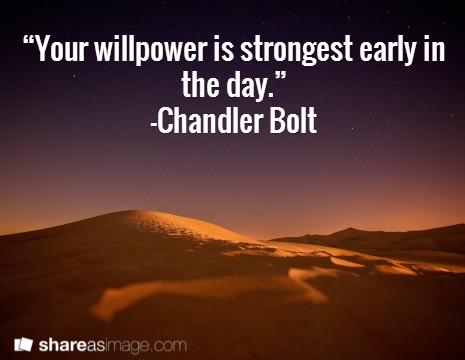 “Your willpower is strongest early in the day.” Click to tweet! What do you guys think? Some useful info on how to make the most out of your side hustle time? Let me know in the comments below!